18th Annual Soul Beach Music Festival Hosted by Aruba | May 23rd-28th, 2018 - TheUrbanMusicScene.com | Concerts & Festivals! Comedy night headliner, Marlon Wayans is an actor, producer, comedian, writer and film director phenomena known for the WB sitcom The Wayans Bros. and film credits Scary Movie, Scary Movie 2, White Chicks, Littleman, Dance Flick and G.I. Joe: The Rise of the Cobra to name a few. With no shortage of ingenuity, Wayans throws down in a new stand-up special filmed in Washington D.C. for Netflix. He continues to light up the screen, starring on a new hit NBC sitcom “Marlon,” which debuted last summer as the #1 scripted series on the Big 4 networks and has been renewed for a second season. Ripping the audience with his audacious stage presence and comedic genius, Wayans’ will deliver uproarious flames of pure brilliance on Friday, May 25th. A true cosmopolitan oasis with a mix of modern luxury and cultural charm, Aruba is a world-class destination where happiness is more than a buzz word, it’s a driving force. Soul Beach Music Festival Hosted by Aruba, previously named #4 by USA Today readers’ choice “10 Best Caribbean Celebrations” and #1 “Caribbean Summer Festival” by Jetsetter Magazine, boasts a truly unique and unforgettable three-in-one experience featuring live music performances, comedy shows and beach parties. Aruba knows how to bring the WOW factor from cutting-edge entertainment, to award-winning cuisine, to upscale retail, to over-the-top-scenic views from a variety of impressive settings. For the discerning traveler, Aruba is the perfect option putting both serenity and adventure at their doorsteps. Soul Beach is more than a music festival, it boasts the trifecta of a visually stunning atmosphere, a multifaceted event and the energy that comes with camaraderie of people across the globe who glow up together under a common theme; to make the heart sing and illuminate a joyful echo of oneness. It’s no wonder festival goers return year after year to indulge the electric collaboration of Soul Beach Music Festivals’ mega gathering and the incomparable experience of Aruba’s paradise. 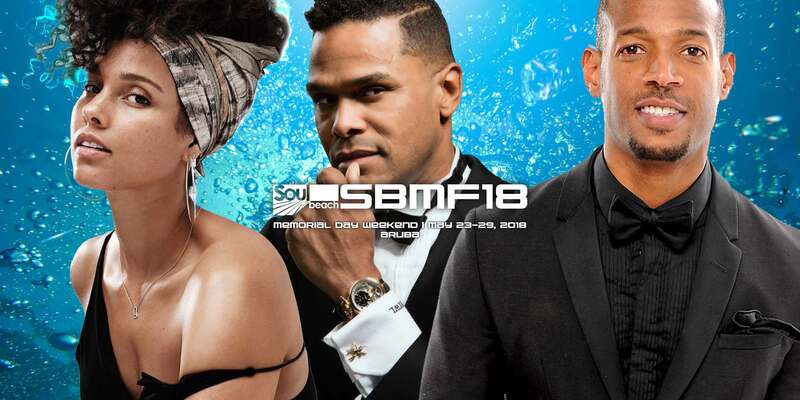 The 2018 Soul Beach Music Festival, #SBMF18, will roll out more highly anticipated announcements of main stage performing artists in the weeks to come. For information about ticket sales, accommodations and the latest updates sign up for CLUB SOUL BEACH, by visiting www.soulbeach.com. Join the Soul Beach Music Festival community: follow us on Twitter and Instagram @SoulBeachMusic and become a fan of the 2018 Soul Beach Music Festival on www.Facebook.com/soulbeach. The 2018 Soul Beach Music Festival is sponsored by Aruba Tourism Authority; additional sponsors include Aruba Hotel & Tourism Association, Renaissance Aruba Resort & Casino, Divi Resorts, Tamrijn Aruba All Inclusive, Tropicana Aruba Resort & Casino and The Mill Resort & Suites Aruba.